The dangers of mixing two different types of drugs are paramount! The power of stimulants, like cocaine, alongside debilitating central nervous center depressants (CNSD's), like Alcohol, is extremely dangerous. When someone introduces stimulants into the blood stream when they are already intoxicated from alcohol the effect is opposite what one might think. Stimulants give the drinker the feeling that they are not that intoxicated, not only can they drink more but they could also negotiate driving home; this common misconception is a deadly one to have, in no way does the addition of stimulants into one's body make you less drunk - only more awake. What about stimulants like caffeine, could it have a similar perception altering affect? A study appeared in the journal of Addictive Behaviors this month which had some interesting data worth sharing on alcohol mixed with energy drinks. The study was conducted by the University of Florida and consisted of 800 young drinkers at bars between the hours of 10pm and 3am. The study observed that people who drank alcohol mixed with caffeine appeared to be more intoxicated than those who consumed pure alcohol. Furthermore, they found that people who were mixing were also much more likely to say they intended to drive home. 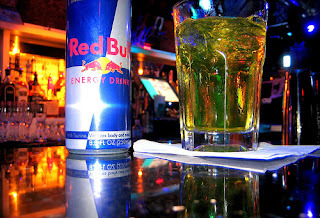 According to the study: "Patrons who had consumed alcohol mixed with energy drinks were at a three-fold increased risk of leaving a bar highly intoxicated...As well as a four-fold increased risk of intending to drive on leaving the bar district, compared to other drinking patrons who did not consume alcoholic beverages mixed with energy drinks". It seems like since the advent of drinks like Red Bull and Rockstar energy drinks people have been concerned: Besides being terribly unhealthy, for some reason they tend to confuse an intoxicated person into thinking they are sharp as a tack - nothing could be further from the truth. It is possible that at some point the mixing of alcohol and caffeine will be outlawed, there are some bars which have made a preemptive strike and no longer allow the mixing of energy drinks with alcohol. Alcohol mixed with energy drinks can be a fatal cocktail and should be avoided.